← PSP Lemmings and the joy of bugs. Lemmings, which I’ve been ranting about lately, is not the OLDEST game on my backlog, even if it does date back to 1991. Let’s move on past that, up to the days when I had my very own computer – a Vic-20 – and was regularly playing games on the more powerful Atari 8-bits, Commodore 64s, and Apple IIs that my friends had. I can’t go putting most of that into the backlog. That’s, well, it’s crazy talk, much as I’d like to go back and really hone my Jumpman skills. So, while defining what exactly I meant by backlog, I was looking at Lemmings and realized that it was probably the third full-priced PC game I ever bought. Before then, well, everything I owned was either a copy of a copy of a copy or it was something I’d gotten from a budget rack or bargain bin during the Great Crash of 1984. Not that there’s anything wrong with budget racks and bargain bins, inasmuch as I find myself delving those depths regularly these days. But I realized that I had, somehow, held on to the first three games I ever put down Serious Money – probably about $35-$40, really – for. So I thought I would abuse you with a picture and then go on about the good old days and blah blah blah blah for a bit. I know why I bought Lemmings and Eye of the Beholder. I’d seen and played them at a friend’s house. I liked both of them, and when you’re a teenager making your first steps from the seedy world of trading floppies at school to the less-seedy world of actually owning legitimate copies of games, you have to like something a lot to put out the money. On the other hand: Beyond Zork. It has the distinction of being the first full-priced PC game I ever bought with my own money and I cannot give you a reasonable explanation for owning it. I’d never played Zork past the point of “Hey, I got in the house! What’s a grue?”, and certainly had never played any of the sequels, and so I cannot tell you why I decided that it was worth a significant hunk of my minimum wage paycheck. It may be the first game I bought SOLELY on the Hype Factor, of hearing people go on and on about how great the Zork games were. It would not be the last time I bought a game solely on hype, to be certain. Anyway, it’s not going on the list. Eye of the Beholder… maybe. I’m kind of curious to see if I can work up the devotion necessary to crawl through it. But not Beyond Zork. Just thinking about trying to play through an old school “Interactive Fiction” game gives me the screaming heebie-jeebies. 3 Responses to Backlog: Insanity Defined. Man… you have all my respect. 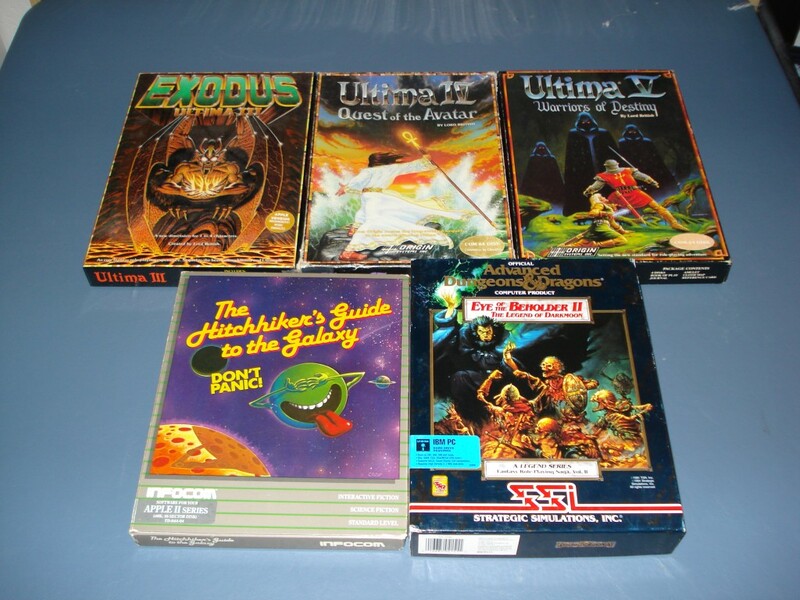 Ultima IV and V, just speechless and also Eye of the beholder II, a piece of history.